Denim Jacket Make's Your Winter Warm! Denim is our winter-long staple that we love to wear. It exudes casual brilliance. As the winter days draw near us, it is time to up the fashion game by pulling out the winter wear in the closet. One remarkable aspect of a denim jacket is that it is unisex. Both men and women can wear them alike. If you love denim jackets, then Affordable is your place to be. Our jackets are made with heavy denim. They are well-tailored and available in different styles. Some of them are classic and feature number of pockets. You can either choose a denim jacket online partial or fully zipped. The best part yet is that you don’t have to splash a hefty amount on our denim jackets and buy denim jackets online with a price better than any other online store in Pakistan. Asymmetrical or Symmetrical Denim Jackets? Denim jackets have been in fashion for decades. Every year, they evolve according to the trends and needs of the consumers. No longer do we see a basic denim jacket. 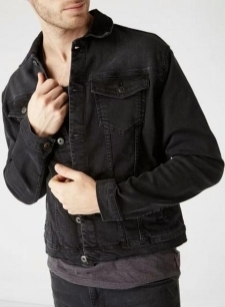 Denim jackets online available at Affordable offer plenty of options to create different yet unique looks. The classic male denim jacket is what we all love and wear. It has a rugged and an old school vibe to it. If you want a classic look then look no more than a blue or black denim jacket for a timeless look. On the trendy side, structured denim jackets are tailored to give more fitted and structured look. A structured denim gives a complete look when paired with some accessories. Contrary to the structured denim, the oversized gents denim jackets are meant to add some extra flair to an ordinary outfit. You can pair them with just about anything. If you want to accomplish a sophisticated look with your denim jacket, then add it with your favorite dress. To a have an edgy look, you can simply put it over your shoulders for some more style and personality. On a lazy day, a classic Levis denim jacket can make your looks more complete as it exhibits symmetrical looks. When you buy a denim jacket online, look for that regal style old denim jackets with different cuts. Vintage denim jackets with vintage designs are not to miss every winter. Affordable offers the best denim jacket price in Pakistan so head on to Affordable to buy denim jackets. When worn the right way, a denim jacket can add a flair of elements to your style. You can never get bored of wearing as it remains a utilitarian outfit for years. A denim jacket has more to offer than casual style. A knitted jumper underneath your jacket worn with ankle boots gives a more urban western classic look. On the other hand, there are countless denim jacket designs. They come in a variety of cuts and styles. You can buy denim jackets of different styles at Affordable.pk. We have cropped denim jackets, the loose or baggy denim for those with a bulky build. The fitted ones are best for layering during the winter peak. For a denim style, the cut and the waist go hand-in-hand. A cut too long gives a loose untucked shirt look, and a cut too short looks more feminine. We have denim button-downs which can be kept up by a pair of denim jeans or slim trousers. For a more relaxed look, go for the baggier denim jackets. They will give you more room for layering or you can pull over a hoodie under it. Try to pair them with base colors of black, grey, or white for more perfect looks. You can also go for a sleeveless denim jacket if you want to exude a trainer look. And don’t forget to pair them with dark shades for a dapper look. Here is the first time you can see mint condition denim trends only at Affordable.pk. Our new denim trends are innovative yet classic. Our denim jacket price is the most affordable without compromising on your style. So head on to the Affordable.pk for the best collection ever!